The live commentary has ended. No further updates will be posted. 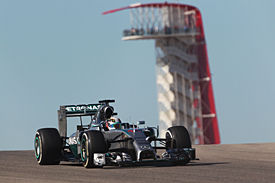 14:48 Welcome to AUTOSPORT's live coverage of Saturday's action from the US Grand Prix weekend at Austin. 14:49 The countdown to FP3 is on, and at the top of the hour we'll start getting our final pointers ahead of qualifying later on. 14:50 The weather in Texas is fantastic again, with sunshine and clear skies awaiting the cars when they come out of the garage. 14:54 All eyes will be on the Mercedes battle for pole later today. As the silver cars continue to dominate F1 2014, there was almost nothing to choose between Lewis Hamilton and Nico Rosberg at the head of the field yesterday. "I have them in my pocket," he said of the three thousandths. "I know where they are, so no worries. I'm going to pull them out tomorrow." 14:59 Another talking point to come out of yesterday's running was picked up on by our technical expert, former F1 designer GARY ANDERSON. Gary was watching from trackside yesterday, and a combination of what he saw and the results from the sessions convinced him that Mercedes is still showing an impressive rate of development this late in the season. The upshot of that? Well, it doesn't bode well for anyone thinking that Mercedes will be easy to catch in 2015. For the full analysis from Gary Anderson and Edd Straw, click here. 15:00 Practice three gets under way at Austin. 15:00 Valtteri Bottas is first out in the Williams. 15:00 Both Lotuses and Kimi Raikkonen's Ferrari also hit the track early. 15:03 It's a cool start here this morning: air temperature 13C; track temperature 20C. Things will heat up later on, so for the moment we don't have particularly representative conditions for what we'll see in qualifying later on. 15:04 Fourteen of the 18 cars present have now been out for exploratory laps, but no one has set a time yet. 15:04 Kevin Magnussen opens the times for McLaren with a 1m48.261s. 15:05 Practice starts are the order of the day so far as drivers leave the pits. 15:06 Magnussen improves to 1m41.567s, while Jean-Eric Vergne goes second on a 1m43.084s. 15:07 Esteban Gutierrez and Jenson Button stick in slow laps for third and fourth. 15:08 Hamilton is asked for feedback on his practice start, and he says it was OK. He then returns for a pass through the pits for another attempt. 15:09 Perez next to do a tentative time. He's slowest of the fifth to do flying-ish laps so far. 15:10 Vergne, Hulkenberg and Gutierrez are now doing more realistic laptimes in second, third and fourth behind leader Magnussen. 15:10 "Temperatures and pressures are still low Nico, so continuous running will be required" - Force India on the radio to Hulkenberg, who locks up while that message is being played back to TV audiences. 15:10 Perez goes second, four tenths off Magnussen. 15:11 Button knocks team-mate Magnussen out of first place with a 1m41.318s, two tenths faster than the Dane. 15:11 Magnussen immediately replies wit a 1m40.837s, putting him fastest again by half a second. 15:12 Hulkenberg has done a quicker lap now too and is third, just ahead of Force India team-mate Perez. 15:13 Hulkenberg moves up to second place between the McLarens. 15:13 Vergne goes to fourth for Toro Rosso, with the fastest final sector time of anyone so far. 15:14 Perez takes second from team-mate Hulkenberg. 15:14 Sutil has had a moment at the end of the backstraight, scrambling to keep the Sauber under control as he ran wide. 15:14 Still only had seven cars do flying laps: Magnussen, Perez, Hulkenberg, Button, Vergne, Gutierrez, Sutil. 15:15 Button restores the McLaren one-two with a time a tenth off team-mate Magnussen. 15:15 Massa is the latest driver hard at work at T12 at the end of the backstraight - he's had a lock-up and missed the apex. It was a pretty gentle approach though, so there's unlikely to be much damage for the tyre. 15:16 Massa goes quickest, his 1m39.820s a second faster than Magnussen's previous mark. 15:17 Hulkenberg moves back ahead of Force India team-mate Perez for fourth. 15:17 BEN ANDERSON is trackside for us in this session, and he says that a lot of drivers are struggling with wheelspin out of Turn 1 on this cool track this morning. He adds that it feels a lot colder than it has the last couple of mornings at the track. 15:17 Bottas's first flying lap is 1.1s off team-mate Massa's effort and that leaves him fourth. 15:18 Perez is the latest driver to go off at the end of the back straight. He locked the inside-front wheel as soon as he hit the brake pedal, and then quickly came off of the brakes to avoid a serious flat-spot. 15:18 Improvements from Button - who closes up on Magnussen for second - and Hulkenberg, who takes fourth from Bottas. 15:19 Kvyat leaps to second for Toro Rosso, seven tenths behind Massa. 15:19 Bottas improves on his next lap and goes third, though he's still 0.9s down on pacesetting team-mate Massa. 15:19 The @WilliamsRacing Twitter account has snapped its former driver Juan Pablo Montoya - now an IndyCar star again after spending so many years in NASCAR - in the team's garage this morning. 15:19 Ricciardo is eighth with his early run, but we're yet to see times from the Mercedes, Alonso or Vettel. 15:20 Massa puts in a quicker final sector, though the lap overall is no better than his current best. 15:20 Ricciardo jumps to second, two tenths behind Massa. 15:21 Vergne is told that Toro Rosso needs to follow a programme dictated by engine supplier Renault at the moment. The Frenchman responds asking if it has anything to do with the fact that his car is "not pulling" in eighth gear today. 15:21 Grosjean leaps up to fourth in the Lotus. 15:22 Bottas sets 'purple' times in the first two sectors. 15:22 Ricciardo jumps up from second to first, beating Massa by a tenth and a half. 15:23 Bottas's lap isn't as quick as Ricciardo in the final sector, so he slots into second, 0.105s behind the Red Bull. 15:24 Ferrari hasn't shown its hand yet in this session, but Raikkonen now goes fifth, between Kvyat and Grosjean. 15:24 Kvyat on the radio: "There is something from my elbow that is disturbing me - belts or something." 15:26 Alonso's first proper lap of the session puts him fourth ahead of Kvyat. "There's a real contrast in performance through these esses. The Red Bull looks absolutely planted; the Williams is quick but lairy; Lotus solid; Ferrari and Sauber and handful, requiring big lifts from the drivers to get through the sequence. "Having said that - Grosjean's just had a massive moment in Turn 5 as he tries to carry more speed. The back steps out but he catches it." 15:28 Vettel is again looking at race pace. He's done a laptime now, but it's 5.1s off Ricciardo's lead mark. 15:29 Approaching halfway through the session and the only cars still to do flying laps are the Mercedes. They've been out for a poke around. 15:29 That was a scrappy lap for Alonso, who was having to work the Ferrari very hard. He was struggling for front-end grip on the way into corners, and getting nasty snaps of oversteer mid-corner or on the exit. 15:31 Another wander from Rosberg, but it doesn't result in a flying lap and he pits again. Hamilton has just done two installation laps. 15:33 Rosberg and Hamilton now come out - is this for a proper run at last? 15:33 Another Sauber in trouble at the end of the backstraight. Gutierrez locks the outside front as he brakes for T12. 15:34 BEN ANDERSON reports from trackside that the Mercedes drivers are "rolling round" together at the moment, and that their engine notes sound "rough". 15:35 Now the Mercedes engines sound "cleaner", we're told. 15:36 Still only slow laps from the Mercedes - Rosberg 5.6s off the pace and Hamilton another 2.4s back. 15:36 "Are you happy with the brakes?" asks Rosberg. "It's not perfect Nico, but let's just try and run," is the response. He's still yet to set a representative time, and sits P18 just behind Hamilton. 15:37 Hamilton does now do a quicker time and goes fifth, 0.4s off pacesetter Ricciardo. 15:38 Rosberg has returned to the pits. 15:38 More on Rosberg from @MercedesAMGF1: "First flyer underway for @nico_rosberg - bit of an unsettled rear end though so he's boxing for further setup tweaks"
15:40 Temperatures are increasing out on track, but very slowly. Air temp has only increased by 2C since the session started, and track temp by just 4C. 15:40 Massa sets the best middle sector of anyone so far, but no improvement in his overall lap and he stays third. 15:40 Hamilton does a new best in sector one, then loses time in the middle of the lap. 15:41 Hamilton has spun at Turn 12. He lost the rear on turn-in, and his car swapped ends, sending him into the run-off. 15:41 The Mercedes is now touring back to the pits. 15:42 Rosberg is now back out on track again after that set-up change with 18 minutes to go. 15:45 Rosberg still doesn't look comfortable with his brakes. He's gone wide at the Turn 11 hairpin, and then goes off at Turn 12 as well. 15:45 Rosberg didn't lock up with either of those moments. The car simply didn't slow down enough. 15:46 Amid all those mistakes, Rosberg does at least inch ahead of Vettel for 17th. World title contender and world champion at the back for now. 15:46 Alonso has switched to soft tyres, and he's weaving aggressively to warm them up at the moment. 15:47 Alonso's Ferrari snaps one way and then the other as he gets a lot of wheelspin out of Turn 1. That was lively! 15:47 Amid all that, Alonso is on course for the top spot with this lap on softs. 15:48 Alonso does indeed go fastest, his 1m39.108s is 0.8s better than on the harder tyres and half a second clear of Ricciardo. 15:48 Alonso ran off track at the penultimate corner on that lap - getting out onto the artificial grass and having a slide. 15:49 Bottas is now setting the pace in the sectors as he tries the softs. Ten minutes to go. 15:49 Bottas has a lock-up into Turn 12 at the end of the backstraight. 15:50 Bottas still goes quickest by 0.7s over Alonso with that lap in 1m38.437s. 15:50 Raikkonen brings the other Ferrari up to third, 0.035s off team-mate Alonso in second. 15:50 Grosjean's soft-tyre lap places his Lotus fifth for now. 15:51 Drivers are having a particularly hard time through the long right-hander towards the end of the lap (officially Turns 16-17-18) as they start pushing harder on these soft-tyre runs. 15:52 Alonso improves his time. He stays second, but closes to within three tenths of Bottas. 15:52 Massa is on a very promising lap now, while Hamilton begins with the fastest first sector yet. 15:52 Button vaults to fourth for McLaren. 15:53 @MercedesAMGF1 says: "The challenge in these cooler conditions lies in getting tyres and brakes all in the working temperature range and working in harmony." It's a challenge that has been getting the better of this year's constructors' champions so far this morning. Hamilton is ninth, Rosberg 17th. 15:53 Massa grabs the top spot from Williams team-mate Bottas. He's two tenths quicker with a lap of 1m38.214. 15:53 Hamilton puts Mercedes emphatically back in front - a 1m37.107s is 1.1s faster than Massa in second. 15:54 Massa and Hulkenberg are impressing BEN ANDERSON with "massive commitment" in Turn 5. "The rear looks really loose as they push on," he adds. 15:54 Hulkenberg and Sutil go fifth and sixth fastest. 15:55 Rosberg is coasting on a soft-tyre outlap now, trying to find clear track. 15:57 Rosberg finally puts a proper lap in with three minutes left and goes second, 0.8s off Hamilton. 15:57 Ricciardo improves his time to sixth. 15:57 BEN ANDERSON tells us Ricciardo has just been baulked by Hamilton through the first sector esses. 15:57 Bottas has had a huge lock-up into Turn 1, smoke pouring from the outside front wheel as he sails past the apex. 15:58 Hamilton is the latest driver to have a lock-up at Turn 12, but he still makes the corner this time. 15:58 Not many drivers improving as we go into the final two minutes. It was just one qualifying simulation lap for the majority at the end. 16:00 Rosberg is now on a better lap, but it's not on Hamilton's pace. 16:00 The chequered flag is out. Rosberg is the main man on a quick lap. 16:00 Ricciardo runs wide at the penultimate corner, and then has a big twitch in the final turn which costs him a lot of time. 16:00 Rosberg loses time in the final sector, so stays second and remains eight tenths off. Remember, Vettel has spent all weekend focusing on race preparation, as he will start the race from the pitlane tomorrow. We'll be back just before 6pm UK time to bring you as-it-happens coverage of the battle for pole position. 16:20 In the meantime, let us know your predictions for qualifying using #autosportlive on Twitter and we'll pick some out in our build-up to qualifying later on. 17:46 The countdown is on to the start of qualifying for the US Grand Prix - and what is likely to be another Hamilton v Rosberg fight for pole position. 17:49 The backdrop to the track action this weekend is the brewing row between the bigger and the smaller teams on the grid - and our Group F1 Editor JONATHAN NOBLE has returned to the media centre saying that Lotus, Force India and Sauber are continuing to work on a plan to have their voices taken seriously by the sport's super powers. 18:00 Q1 begins: 18 minutes to make 18 cars become 14. 18:01 Sebastian Vettel is an obvious likely departure as he's guaranteed a pitlane start. It's set to be a Lotus versus Sauber battle around him. 18:02 Despite the pressure on them, the Lotus pair and Sauber driver Adrian Sutil are among those hanging back in the pits. 18:03 Sergio Perez sets the first laptime: a 1m39.804s. 18:04 Hulkenberg only does a warm-up lap of 1m44.071s. 18:04 Daniil Kvyat goes second, 1.2s off Perez. 18:04 First Kevin Magnussen, then Nico Rosberg hits the front. 1m38.848s for Rosberg, 1m39.6s for Magnussen, 1m39.8s for Perez. 18:05 Valtteri Bottas beats Rosberg by 0.037s to go fastest. 18:05 Felipe Massa pops into third, a tenth off the top spot. 18:05 Now Lewis Hamilton sets the fastest time, only by 0.016s over Bottas, though. 18:06 Everyone is now on track except the Red Bulls. 18:06 Hamilton had a minor lock-up at Turn 12 (not for the first time this weekend), but it didn't seem to affect him too much. 18:07 Sutil thrusts the Sauber up to fifth on soft tyres. 18:08 Sutil's team-mate Gutierrez, also on softs, is a second slower in 13th. 18:08 Rosberg takes first place off Hamilton with a lap 0.196s faster. 18:09 Hamilton on the radio: "Big flat spot - I can't continue." 18:10 Vettel puts in a token lap on soft tyres and it's actually good enough to put him ninth. 18:11 Maldonado, using softs, jumps up to fourth place. 18:12 After being overshadowed all weekend, is Rosberg out to prove a point in Q1? He's just banged in a 1m38.303s to extend his advantage to 0.4s, despite losing time in the final sector. 18:14 Ricciardo does his first lap of the session and goes fifth, setting the best final sector time of all. 18:15 Alonso jumps from 11th to a very safe second. 18:15 Magnussen goes from 15th to third. That puts Vettel out, which he would be anyway. 18:16 Button is now in the dropzone as Gutierrez improves to 15th. 18:16 Vergne pulls himself to safety, but only momentarily before Button leaps to fourth and clear of trouble. 18:17 Hamilton has come back out on softs and he does a 1m37.196s to go fastest by a massive margin. 18:17 Massa and Bottas quickly improve on softs too to go second and third, 0.7s and 1.1s off Hamilton. Rosberg now 1.2s off the pace in fourth. 18:18 The final sector is busy as everyone looks for clear track for their final laps. 18:18 Grosjean starts one last lap just in time. He's currently slowest. 18:18 While Grosjean just made it past the flag in time, his team-mate Maldonado looks safe in ninth at present. 18:19 Grosjean locks up and goes off at Turn 12, surely ruining this lap. 18:19 Perez is only 0.022s above the cut-off but is improving. 18:19 Grosjean duly fails to improve and stays 18th and last. 18:20 Maldonado lets out a woosh of relief on the radio as he is told "Nice job, back to the pits," to prepare for Q2. 18:21 "Yes, I'm sorry, it's not the same car as this morning," says Grosjean. His engineer responds with "Don't think I need to tell you where we we are," and when the driver guesses "we are out..." he's told "by a country mile". Ouch. 18:26 We're green for 15 minutes of Q2. Fourteen cars start, four have to go. 18:27 Given the focus on their teams bringing up the rear after Marussia and Caterham's exits, Sutil and Maldonado will be very pleased to have brought Sauber and Lotus into Q2. Getting further will be a huge challenge, though. 18:28 Hamilton is told: "Just remember, this could be your race set." The drivers that make it through to Q3 have to start the race on the tyres that they set their fastest Q2 time with, and Mercedes is making sure the world championship leader doesn't forget that. 18:30 Bottas locks up into the tight Turn 15. 18:31 Rosberg and Hamilton set the early pace with laps of 1m37.099s and 1m37.287s respectively. 18:31 Alonso, Bottas, Ricciardo and Raikkonen fill the initial top six out. 18:31 Rosberg is reporting "quite a lot of understeer". 18:31 Kvyat, Hulkenberg, Maldonado and Perez are the bottom four of those to do times so far. McLarens and Sutil yet to complete laps. 18:32 "I've got a vibration on these tyres already," says Hamilton. 18:33 Magnussen goes fourth with his first flying lap. 18:33 Button immediately takes fourth off Magnussen, while Sutil is only 12th. 18:36 "Track clear ahead and behind, so just manage your tyres as discussed in the garage" - Force India to Perez. 18:36 Just under four minutes to go and the first few cars are starting to filter back out for their last shots. 18:38 Perez is first to have a go, and he moves up from 14th to 10th, putting Kvyat out. 18:38 Perez missed the apex of the final corner, which could prove costly. 18:38 Hulkenberg improves too, but only to 11th. Not looking good. 18:38 Massa jumps to third with a lap that includes a new fastest overall middle sector. 18:39 Hulkenberg is going to miss out, he's not improving on his next lap now he's taken the best of the tyres. 18:39 Bottas moves up to fourth place. 18:40 Pacesetter Rosberg is on a better lap again. Hamilton hasn't come back out. 18:40 The chequered flag is out. Sutil and Maldonado are doing their utmost to get up from 13th and 14th. 18:40 Rosberg improves to a 1m36.290s, the weekend's best lap so far and a second clear of Hamilton. 18:41 Sutil jumps to ninth! Sauber potentially into Q3 and Raikkonen temporarily out, before recovering to ninth. 18:41 Maldonado can only make it to 11th, a tenth off Sutil in 10th. 18:41 Kvyat doesn't improve, he stays 14th. 18:42 "P10! We made it! Good job, Adrian." 18:42 A couple of replays reveal that Maldonado got out of shape at Turn 1 on the power, and then went off in the penultimate corner as well. 18:43 That Sutil result is the first time Sauber has reached Q3 all year - and what a time to do it amid its starring role in the cost crisis row. 18:48 Q3 gets going, with Ricciardo first to leave the pitlane. 18:49 The Williams drivers, plus Button and Raikkonen are also early takers. 18:50 And now everyone is out except Sutil, who has possibly forgotten what Q3 involves and will need to be reminded qualifying is still on. 18:51 Ricciardo is first over the line with a 1m38.120s. 18:52 Bottas does a 1m36.906s to beat Ricciardo by 1.2s. 18:52 Button goes second, eight tenths off Bottas. 18:53 Massa slots into second in a Williams one-two, four tenths off the Finn. 18:53 Magnussen and Alonso place fifth and sixth. 18:53 Rosberg takes provisional pole with a 1m36.282s, two tenths faster than Hamilton manages. Bottas is 0.7s off Rosberg. 18:54 Button says he is "still struggling with locking up at Turn 1". McLaren responds with "Yeah, we saw that". 18:54 So far then, Rosberg's declaration that he had time in his pocket after free practice is looking to be correct. Let's see what Hamilton can do to respond on the second runs. 18:55 The gap between the two Mercedes is currently 0.161s in Rosberg's favour. 18:55 Rosberg asks Mercedes to check the left-front corner of the car - particularly the front wing - as he has hit a kerb hard somewhere. 18:56 As Rosberg's car is up on the jacks in the garage, a mechanic kneels down for a closer look underneath the front wing. 18:56 With three and a half minutes to go, Ricciardo is first out again to begin the second runs. 18:57 Of the two Mercedes, Rosberg was first to leave the pits so will be setting the target for Hamilton to try to beat. 18:59 Bottas starts his flying lap following a wiggle of oversteer as he boots the throttle out of the final corner. 18:59 Rosberg beats his previous best in sector one. 18:59 Hamilton is down on Rosberg at the first split. 18:59 Ricciardo moves up from eighth to fourth. 19:00 Rosberg is quicker again at sector two. 19:00 Raikkonen edges up to seventh. 19:00 Not looking great for Hamilton in sector two either. 19:00 Rosberg improves the pole time to 1m36.067s. 19:00 Alonso gets back up to sixth place. 19:01 Hamilton does the best final sector of all, but it's not enough - he stays second and doesn't improve on the lap overall. 19:01 Bottas can't improve on his earlier time and stays third. 19:01 Final gap between Rosberg and Hamilton is 0.376s. 19:02 Rosberg is told "really good job - save some fuel," and there's no discussion of the gap to Hamilton just yet. 19:02 Bottas thanks Williams for a "really nice and solid qualifying". 19:06 Handshakes and a bit of a chat between Rosberg and Bottas as they wait for Hamilton to join them for the post-qualifying photo. 19:07 Hamilton doesn't make them wait long, and that's the formality of the waving to the cameras done with. 19:12 While that session was going on, our F1 team in the paddock got the latest on the row involving the smaller teams and their fight for survival. Force India's Bob Fernley says "nothing is off the table" in terms of what action his outfit, Lotus and Sauber could take this weekend. To read the updated story click here. 19:16 Rosberg on taking pole: "It worked out really well together with my engineers, we arrived at a car in qualifying I was happy with. The balance was good. "Conditions have been changing a lot so it's not easy to get everything right. First place today is awesome but the race is what counts, so we need to focus fully on tomorrow and try to bring it home." 19:17 Hamilton explains that he had problems with brake temperatures - "that is perhaps where I was losing a lot of time". 19:18 Bottas admits that a lockout of the second row of the grid is important for Williams and its ambitions in the constructors' championship, as it fights to stay ahead of Ferrari and McLaren to hang on to third in the standings. 19:25 Romain Grosjean was deeply unhappy after ending qualifying slowest. He believes he had the potential to be a high as seventh in Q1. 19:27 Vettel is the man who's starting right, right, right at the back with his penalty leaving him in the pitlane. "I think it will be difficult. Everybody behind the Mercedes is very close to each other. "It will be tough to overtake but there's a chance to score some points." 19:29 While one Lotus driver was morose, Maldonado was pretty upbeat about taking 11th place, right on the cusp of the top 10 - though he was also kicking himself a little for missing Q3. "For sure there's something more in there. I did a little mistake on the second to last corner that cost two tenths, but let's see for tomorrow. "We are in a much better position to fight than all the other races before. Let's fight for points." "I think it's a good job - very close to Felipe so maybe ahead of him would've been a great job. Realistically third is what we're fighting for in the race, and fifth is close enough to third to achieve that. "We look comparable to the guys around me in the Williams. It's just going to be a matter of getting that track position, keeping a few elbows out. They've got a bit more pace on the straight." 20:02 AUTOSPORT Live's United States Grand Prix coverage will resume just before 8pm UK time on Sunday for the race itself. See you then. And in the meantime, keep up with all the qualifying reaction plus the latest developments in the cost crisis row via our news pages.